Team Alpha duel a squad of B.A.T.s while Cobra deploy their final weapon against the cities of Nanzhao. Five miles from Nanzhao's Thai border, G.I. Joe Team Alpha holds the line against Cobra forces in the pouring rain... and, against all odds, their foes are retreating. Roadblock suggests that they go after the routed Cobras, but Flint shoots him down, pointing out that the G.I. Joe and United Nations forces have been whittled down to the point of not having a single able platoon. 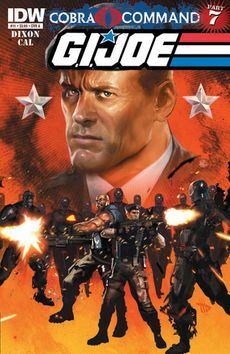 Roadblock argues for a good offense meaning fewer Cobra forces to take down later, but Hawk orders him to stand down: the Joes are there to cover the refugees and the United Nations' retreat into Thailand, and there's no saving Nanzhao; for all intents and purposes, it doesn't exist. Moments later, a Joe comes running in with an update from their air recon units, with terrible news; Cobra didn't run because of the Joes, but because of what's coming for them: a unit of B.A.T.s, deployed south of them and moving towards them. At that moment, the androids are overrunning U.N. combat unit Hammer, and slaughtering the U.N. troops to the last man; Flint's best suggestion is to use the terrain to take them out, moving east to a chokepoint on the river where they can try to hold against the attackers. On the Rhozho River causeway, Tripwire and Beachhead set explosives on the bridge's piers. As Flint keeps watch, he spots four of the B.A.T.s approaching, and calls Hawk to see if the General has had any luck in getting access to heavy ordnance; however, the general is still working on the problem, radioing back to Fort Baxter for help. While Mainframe negotiates with the former agent Chameleon, Scarlett answers Hawk's call, and promises to get whatever support she can while Team Alpha holds the line. The charges placed, Tripwire and his team prepare to blow them, but the B.A.T.s are too close, leading Flint and Roadblock to stay on the bridge and hold them back, telling their teammates to blow the bridge regardless; the two succeed in destroying one of them with a TOW missile, but when the explosives detonate, Flint and Roadblock go tumbling into the river in the Joes' vehicle. While Hawk sees the U.N. forces on their way, the two Joes keep firing at the remaining B.A.T.s, but are unable to stop them from keeping coming... much to the pleasure of Laird Destro, who's watching over a video link. Destro is contacted by Cobra Commander, who he informs that the destruction of Nanzhao's cities is imminent, and that the B.A.T.s have driven the U.N. troops across the border; Destro slyly suggests that Cobra will need an occupation force capable of existing in an irradiated environment... such as more B.A.T.s, which can be constructed by M.A.R.S. Industries. Cobra Commander agrees to the idea, and has the arms dealer begin construction. From a Skystriker over Pnom province, Joe pilot Ironhand calls in an urgent report: an unmanned Cobra drone, armed with a bomb and heading for Pnom Pnap. Mainframe doesn't understand why Cobra could drop a bomb on an evacuated city, but it's made more clear when the markings on the bomb are revealed: nuclear hazard signs! With Mainframe unable to hack the drone within the necessary twenty minutes, and Hawk unable to answer his calls, Scarlett is forced to make the call of where to drop the bomb; out of other options, and not wanting to risk there still being people within Pnom Pnap, she has Ironhand shoot the drone down over a wilderness area, ravaging the jungle around it but stopping the destruction of the city. In Dvarati, capital of Nanzhao and Cobra's temporary headquarters, Savane recieves the news with dismay; but Cobra Commander is unfazed by the interception of the Pnom Pnap bomb, content with the other bombs being dropped successfully. As Team Alpha look on, mushroom clouds rise up from the sites of five of Nanzhao's cities; by the Commander's words, it is Cobra's world now, and no-one will stand in their way. "What about Nanzhao, General Hawk?" "It's Cobra's. For all intents it no longer exists as a nation. The surviving population's fleeing as fast as they can. The world's attention shifts from war to a refugee crisis in Myanmar, Thailand and Laos. I'm hearing that Cobra's applying for membership in the United Nations. "How lovely ye are. Unstoppable. Untiring. And without pity. The perfect instrument of war. And never prey to the limitations of nature." Flint and Team Alpha first faced a B.A.T. in G.I. Joe vol. 2 #6. Roadblock refers to the Davy Crockett he picked up back in G.I. Joe issue 5. Cover A: Hawk is having a bad day, while Flint and Roadblock fight B.A.T.s, by Dave Wilkins. Cover B: Skystriker vs Cobra drone, by Wil Rosado and Romulo Fajardo, Jr.
Cover RI: Duke, Beachhead, Flint, Roadblock, Scarlett, and Cobra Commander's arm, by David Williams and Kelsey Shannon; combines with the RI covers to Cobra Command, Part 8 and Cobra Command, Part 9 to form a complete image. This page was last edited on 7 October 2017, at 22:42.